I am available for presentations about a variety of topics related to my practice, including art, the environment and social justice. I have given presentations to a wide variety of audiences, from national conferences to local business, civic, religious, and non-profit groups. I also have over 30 years experience teaching art, photography and architecture as well as in environmental advocacy. Presentation format is flexible. Presentations usually include a slide program along with an interactive lecture/discussion of the topic or project requested. Presentations can be tailored for a specific audience and can run from thirty minutes to an hour and a half. Inquire about speaking fees and pro bono presentations. This was a year-long residency in Milwaukee's Menomonee Valley. For a complete description and links to images, writings, and events click here. 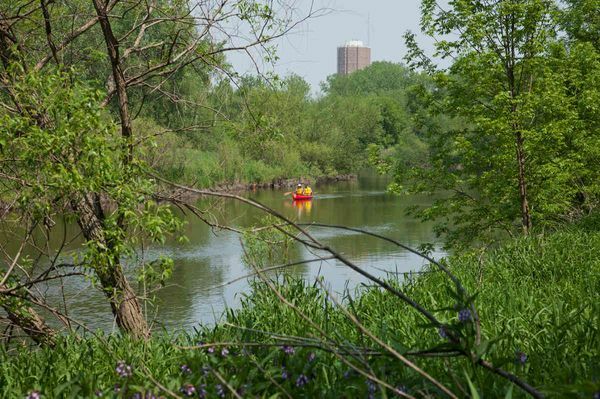 Presentation can be a talk about the value of urban natural areas in general, Milwaukee watersheds specifically, or a reading from the book, Urban Wilderness: Exploring a Metropolitan Watershed. The newest component of this ongoing project is A Wealth of Nature: Parks and natural areas in Southeastern Wisconsin. More information available at awealthofnature.org. I am also available to make presentations about my experiences in Nicaragua working with Bridges to Community. If you are interested in a life-changing experience or you belong to a church, community organization, or other group that might want to know more about the Nicaragua Brigades feel free to contact me or go to the Bridges to Community website. More information and links to images at Nicaragua Brigades. As a board member of Preserve Our Parks, I am responsible for a project called A Wealth of Nature, which promotes and advocates for parks, preserves and open space in Southeast Wisconsin. To learn more about this project go to its website. To schedule a program contact me, Eddee Daniel, at 414-771-8857 or by email at eddee@eddeedaniel.com.